TeamPayer is an online solution for splitting and paying your portion of the team fee. 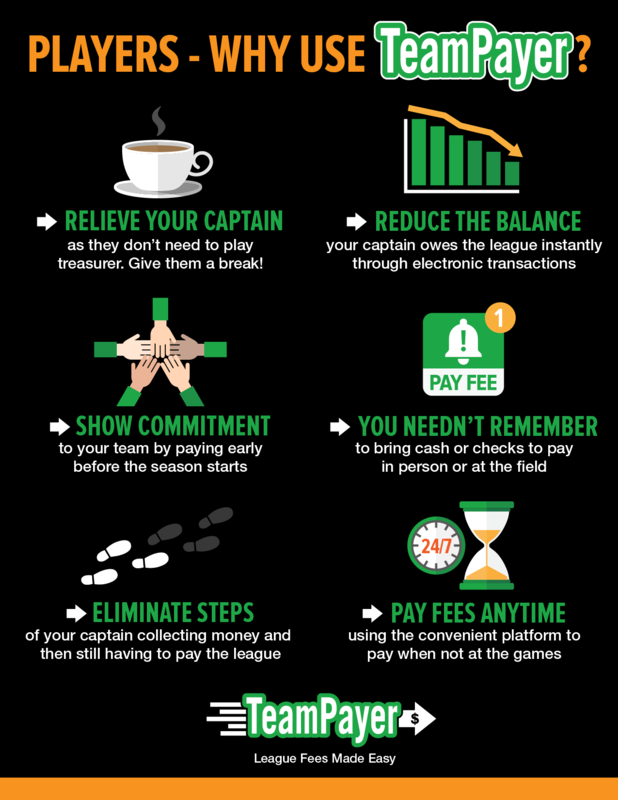 Captains can assign a dollar amount that the player owes when they invite them to join any team. When the player accepts their invite, they simultaneously pay their team portion directly to the league. The amount the Captain is responsible for is reduced as each player payment is made. A $1.95 transaction fee is added to each player fee when using TeamPayer. For example, if you request $100 from a player, they will pay a total of $101.95. Why should I pay with TeamPayer, won't I see the captain at the game? How much can I request as a captain? TeamPayer allows the Captain to request TWICE the amount of your team balance. So if you have a $500 team you can send out $1000 worth of TeamPayer requests, just know that the system will only collect the first $500 and wont “over-collect” beyond the balance due. In many cases, not everyone will be able to accept your invite and play on certain dates or leagues. Many smart captains will “over-invite” players so that they have additional players for weeks they will need subs, and to lower the cost paid by each player. Inviting just the bare roster minimum normally means you will be scrambling for subs every week when the normal parts of life like vacations, weddings, and someone getting busy or sick roll around. So, are my team members paying ME with TeamPayer, or the league? Unlike many money-sharing services, when one of your players pays a TeamPayer request, that amount goes directly to the league. The league fee balance you are responsible for as the team Captain is then reduced accordingly. Your teammates are paying the league directly, so that you don't have to try and collect money from them in person.